When it comes to drumming, Leah Burke is usually on beat—but real life isn’t always so rhythmic. An anomaly in her friend group, she’s the only child of a young, single mom, and her life is decidedly less privileged. She loves to draw but is too self-conscious to show it. 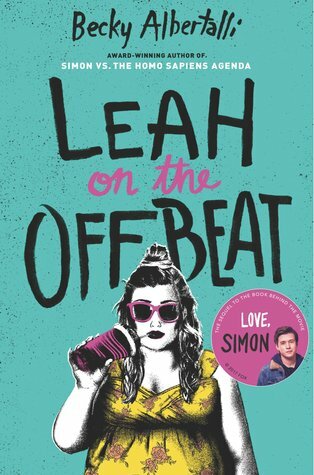 And even though her mom knows she’s bisexual, she hasn’t mustered the courage to tell her friends—not even her openly gay BFF, Simon. So Leah really doesn’t know what to do when her rock-solid friend group starts to fracture in unexpected ways. With prom and college on the horizon, tensions are running high. It’s hard for Leah to strike the right note while the people she loves are fighting—especially when she realizes she might love one of them more than she ever intended. Oh gosh. I cannot tell you how long I have been waiting for this book to come out ever since I heard about it. Simone Against the Homosapien Agenda is one book that has been close to me since I read it. And the fact that I now have Leah's story makes all the difference. Continuing the story of Simon we now follow Creekwood's favorite gang, Simon, Blue (yes I am still calling him Blue), Leah, Abby and Nick. It is senior year and as the gang is not only preparing for the school play, the school dance, as well as keeping up with their grades, they have the lingering thought of graduation and college selection to look forward to...or not. Senior year is an important year for a teen's life. For Leah this year is one of her most important. She is about take risks, challenge friendships and lastly, find herself. Being inside of Leah's head was such an enlightening experience. I was able to become more aware of certain feelings she had towards some people but also realize the struggles she had to deal with on a daily basis when she was not around her friends. Leah has definitely climbed up the row of being one of my favorite characters. It is not high school without a little drama, and oh boy did this book have some drama. I do not know if I was fully happy with outcome of one of the characters but I know I am happy with a couple outcome. I don't want to say anything else so you will just have to read and find out. Albertalli is writes pure magic and this sequel in the Simon-verse just expanded the love and admiration I have for both these books and the Becky herself. Written to mirror the life of a typical high school, Becky's story is not shy of perfection.